Donal Coghlan is taking up an unspecified role in the private sector. 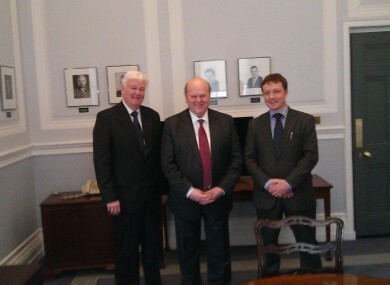 Bobby McVeigh (l) and Donal Coghlan (r) with Michael Noonan earlier this year. THE MAN IN charge of reshaping the credit union sector in Ireland has resigned to take up a new role in the private sector. Donal Coghlan had been in the job as the CEO of the Credit Union Restructuring Board (known as ReBo) for 14 months. The government set up the board to look at how credit unions’ business model should work in the future, including helping credit unions around the country with their restructuring plans. The board was established in January 2013 and is expected to be finished its work by the end of next year. Coghlan’s replacement has already been announced as John Doyle, who has been head of restructuring at ReBo. He will be the interim CEO with effect from 1 September. In a statement, board chairman Bobby McVeigh thanked Coghlan for his work in “delivering strong leadership and success in what is an exciting and sometimes challening period of transformation within the sector”. Email “The man in charge of restructuring credit unions has resigned after 14 months”. Feedback on “The man in charge of restructuring credit unions has resigned after 14 months”.